Cosmetic trolley S-5 Chipboard, buy at the price of 67 in Europe. 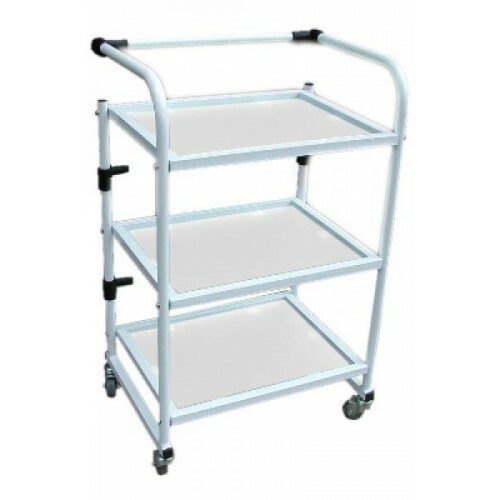 This trolley will perfectly complement the rest of your beauty equipment; it will make the work of a wizard faster, comfortable, and thus will give your beauty parlor the perfect views. In today s market, there are many similar products, but we want to introduce you the cosmetic trolley S-5 Chipboard, having a number of advantages. Cosmetic trolley S-5 is equipped with three shelves made of frosted glass or of high-quality chipboard, which size is 36 30 cm. The size of the product is 80 45 35 cm. Rubber wheels make the product very mobile. Gross weight of a cosmetic trolley is 7 kg. The equipment is presented in white; its foundation is solid metal construction.